When sad and difficult times come along we are here to help you, particularly when you lose a loved one. 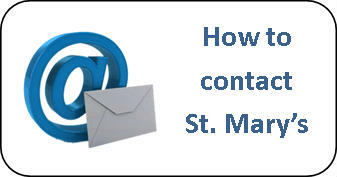 At St Mary's, our Vicar is able to lead funeral services both in St. Mary's and also at the crematorium if you prefer. We can also spend time with you in your grief and support you in every way we can, particularly by praying for you and your family at this time. Do contact us if you need help. 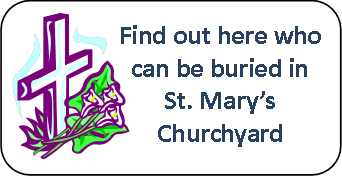 You may be thinking about a burial in St. Mary's Churchyard or interring ashes there. 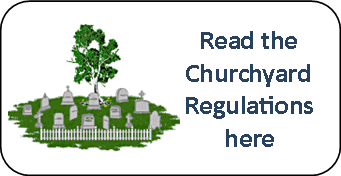 If so then please do read the details of who can be buried in the Churchyard by looking at the Churchyard burial policy which you can access by clicking on the button on the right. 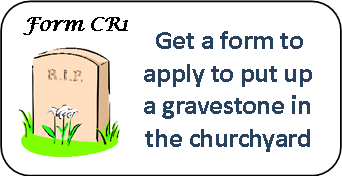 If you would like to put a gravestone in the Churchyard in order to mark the grave of your loved one then you will need to apply on Form CR1. Similarly if you want to amend the wording on any existing stone. Usually your funeral director will help you complete this form and can advise you on all the regulations that apply to such gravestones. St. Mary's Churchyard is a beautiful and restful place which many people visit. There are regulations set nationally to preserve places of rest like this. We have to ensure that these are complied with by all the families and friends of those who are buried here. So if you are thinking of altering a grave or planting on it then please do read these regulations in advance.